Mostly though the code is just meant as a starting point for people who want to play with a balanced (non-Latin square design) data set to understand the consequences of coding your predictor variables in different ways. This entry was posted in Statistics & Methodology, statistics/R and tagged ANOVA, coding, collinearity, main effects, R code, simple effects, sum coding, treatment coding. 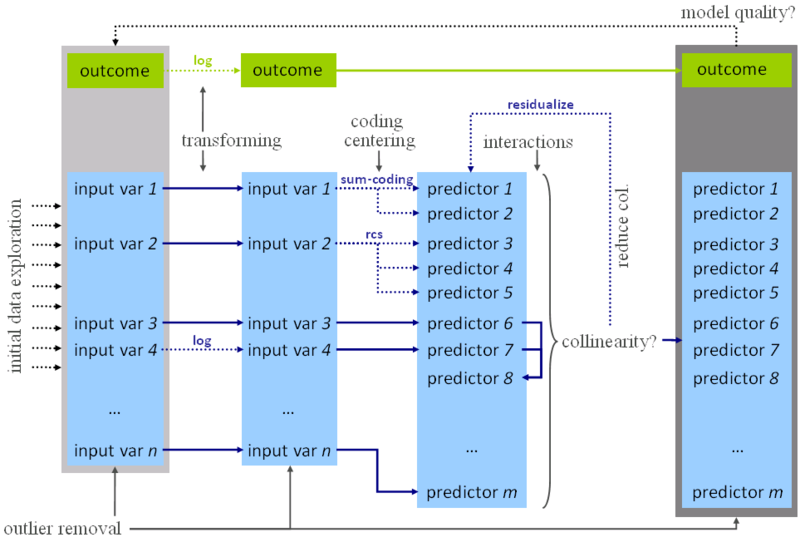 While Victor Kuperman and I are preparing our slides for WOMM, I’ve been thinking about how to visualize the process from input variables to a full model. Even though it involves many steps that hugely depend on the type of regression model, which in turn depends on the type of outcome (dependent) variable, there are a number of steps that one always needs to go through if we want interpretable coefficient estimates (as well as unbiased standard error estimates for those coefficients). This entry was posted in HLP lab, Statistics & Methodology, statistics/R and tagged centering, coding, collinearity, model development, outlier exclusion, regression, transforming, visualization. We used both Baayen’s 2008 textbook Analyzing Linguistic Data: A Practical Introduction to Statistics using R (available online) and Gelman and Hill’s 2007 book on Data Analysis using Regression and Multilevel/Hierarchical Models, both of which we can recommend (they also complement each other nicely). If you have questions about this class or you have suggestions for improvement, please send us an email or leave a comment to this page (we’ll get notified). This entry was posted in class/tutorial, statistics/R and tagged collinearity, mixed models, multilevel models, regression.